Washington spring beauty is an annual, rhizomatous species that is found in North America in British Columbia, Washington, Oregon and California (USDA 2011). In British Columbia, it is found in the southwestern corner of the province where it occurs on moist to mesic mossy rock outcrops and forests in the lowland and montane zones (from approx. 600 m to 1000 m). In his rare plants of the Fraser Valley article, Lomer (2011) says: "A species derived from hybridization of two common species: Claytonia perfoliata Donn ex Willd. and C. sibirica L. It grows on mossy rock outcrops on the north side of the Fraser from Horseshoe Bay east to Pitt Meadows (UBC: Lomer 3949), and perhaps can be found in similar sites east of the Pitt River. It is early flowering, from March to May, and typically grows on low diversity mossy sites that dry out completely by the end of spring." Extracted from Botanical Electronic News #432, January 2011, with permission. Annual herb from a slender taproot or short rhizome; stems spreading to erect, few to several from the root crown, 5-40 cm tall. Basal leaves numerous, the blades egg-shaped to deltoid, 1-5 cm long, tapering to a 2-35 cm stalk; stem leaves paired, free or sometimes fused below on one side, more or less round to egg-shaped, unstalked, 1-4 cm long. Inflorescence of terminal and axillary racemes with 5-25 flowers on stalks 1-5 cm long, nodding in bud but spreading in flower, with bracts 1 per 2-4 flowers; petals white or pink (fading to white), 4-5 mm long; sepals 2.5-4 mm long. Capsules, 2.5-3.5 mm long; seeds 1, elliptic, black, shiny or dull, 1.5-2 mm long. 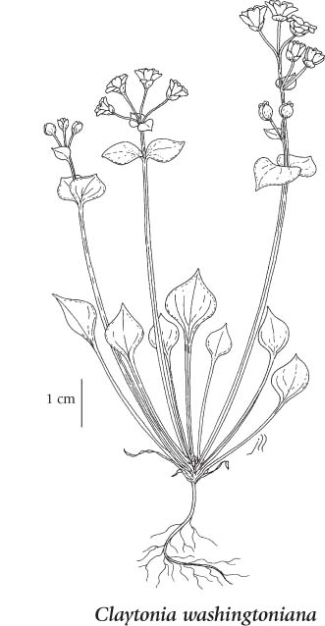 This species is considered to be of hybrid origin between C. sibirica and C. perfoliata. Moist to mesic mossy rock outcrops and forests in the lowland and montane zones; rare in SW BC; S to CO and CA.